Here at DeansCards.com, we have a lot of professionally graded cards, so we thought we would focus on a particularly cool segment of the graded card population: cards with qualifiers. Qualifiers are the letters that sometimes go after grade. Some of the more common qualifiers are MC (miscut), MK (marked), and OC (off-center). On average, a qualifier bumps price of the card down by two numbers. Therefore, if you found a PSA 7(OC), you would be paying the PSA 5 price. Qualifier cards are a great way to buy expensive cards at discount without sacrificing condition. The cards mentioned in this article are no exception. The 1933 Goudey baseball card set features a total of four Babe Ruth cards and all four command a premium price. Card #53 is a close up of Ruth batting against a yellow background. It is probably one of Ruth's most popular cards from the 1930's. Our card grades a PSA 4(MK) because a previous owner wrote "BOS" on the back of the card and then erased the mistake, just as the Red Sox ownership surely wished they could erase the mistake of trading away Ruth. Aside from the mark on the back, the card is in remarkable condition. 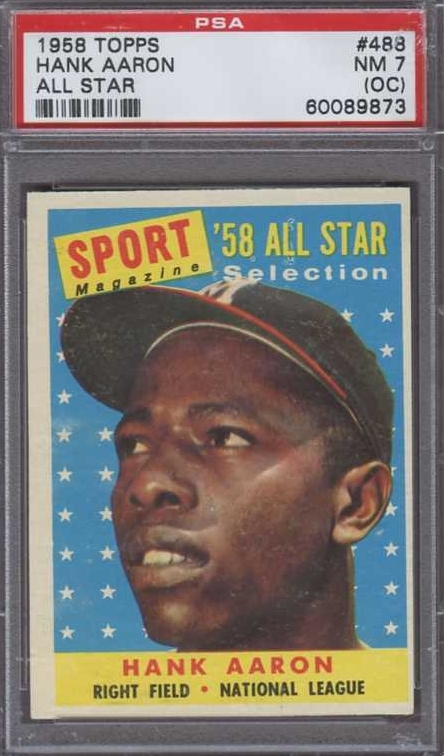 Another favorite qualifier card in our inventory is the 1958 Topps #488 Hank Aaron All-Star card PSA 7(OC). The card commemorates one of Aaron's best years in baseball. In 1957, he won the NL MVP Award, the only one of his career, and the Braves went on to win the World Series. This card has incredibly clean corners, but the left/right centering is off by as much as 80/20 at the bottom. 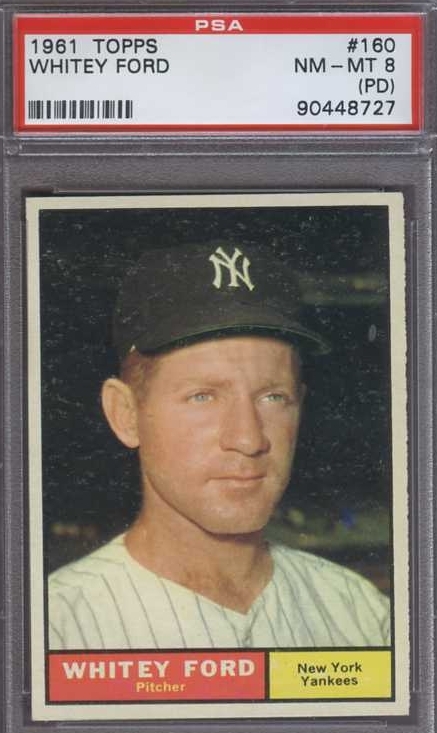 The 1961 Topps #160 Whitey Ford card would normally be a fairly unremarkable card, except that our is a PSA 8 NM-MT(PD), meaning that it has a print defect. These cards are particularly hard to find in a PSA 8 or higher. Nearly 90% of all 1961 Topps #160 cards grade lower than PSA 8. But what is especially interesting about this card is that the "print defect" is very difficult to find. It is a small blue blur in the background of the card. It almost appears to be a spectator in the stadium behind Whitey Ford. Buying a qualifier card is a great way to find a deal on a rare or expensive card. 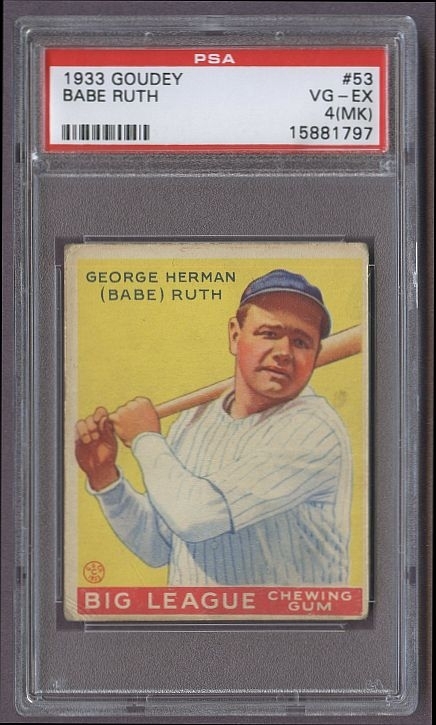 Please click here if you would like to see our inventory of professionally graded cards.